Hello, and welcome to The Homestead! My name is Melanie Frick, and while I’m new to the world of genealogy blogging, genealogy has been an important part of my life for over a decade. I’m sure any genealogist can relate to the most frequent questions I receive when someone learns what I do: Where did your ancestors come from? How far back does your family tree go? I always struggle to give a brief answer to these questions, because I realize that to answer the questions completely would be more than one would bargain for when making polite conversation. My ancestors were Danish immigrants who homesteaded in southeastern South Dakota, and frontiersmen who made the trek from coastal North Carolina to southern Illinois at the dawn of the nineteenth century. They were Acadians who were forcibly exiled to Massachusetts in the midst of the French and Indian Wars, and German farmers who found their paradise in the peaceful rural communities of northeast Iowa. They were immigrants who made their homes in the hustle and bustle of Chicago, and pioneers who made their lives on the plains of Kansas. They were French fur traders in the harsh landscape of seventeenth century Quebec, and English immigrants who supported their new nation in the Civil War. They were husbands and fathers, wives and mothers, farmers, soldiers, businessmen, teachers, midwives, millworkers. 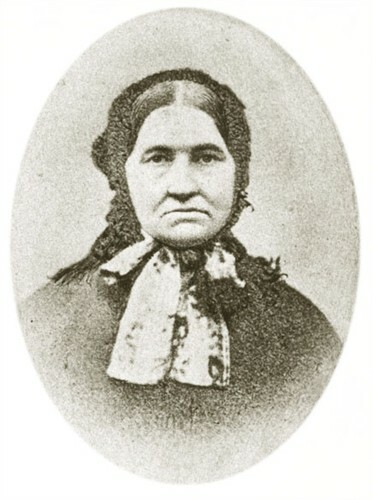 Inger Marie (Hansen) Bramsen photograph, ca. 1870; digital image ca. 2001, privately held by Melanie Frick, 2013. The location, condition, and characteristics of the original are unknown. They were raised in dank sod houses, in cabins, in sturdy farmhouses and village homes, in crowded tenements. They were taught to read and write at home, in convents, in one-room schoolhouses. They were never taught to read or write. They married one, two, three, four times. They raised a dozen children. They buried baby after baby. They buried their spouses. They divorced. They celebrated their golden anniversaries. They saw their farms and businesses fail. They saw their farms and businesses succeed. They mourned homelands that they would never see again. They returned to their homelands to find their loved ones gone, their homes abandoned, their communities changed. They stayed in the same village for all of their days. They crossed oceans, continents, always in search of a better life. They died of gunshot wounds, consumption, influenza, drowning, alcoholism, buggy accidents, airplane crashes, cholera, typhoid, diphtheria, tetanus, suicide, senility, heart failure, pneumonia, old age. Their graves are marked by towering headstones. Their graves were never marked. No one remembers their names. These are the stories I love to tell. What will happen on The Homestead? For now, I plan to explore what I find most enjoyable to write, and what others find most enjoyable to read. I will write about my own genealogical research and historical events that impacted our ancestors, as well as tips and tricks for identifying old photographs, archiving genealogical material, and breaking down brick walls. I may even include the occasional book or product review. I hope that you will enjoy following along with my experiences as a young professional in the field of genealogy, and I look forward to hearing from my readers. Thanks for stopping by! This entry was posted in Uncategorized and tagged family history, genealogy on August 28, 2013 by Melanie Frick.